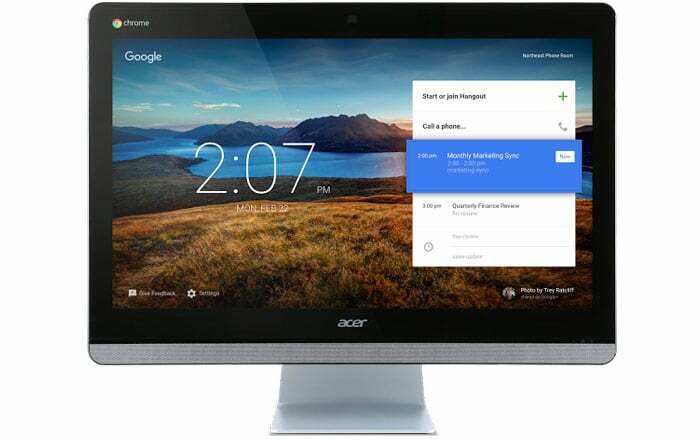 Google and Acer have just announced the launch of a new Chromebase all-in-one computer which they have targeted towards those who frequently hold video conferences at work. Capable of 25-person Hangouts sessions, this machine provides a number other unique software based features as well. The functions of the new Acer Chromebase are identical to those of the Chromebox which was launched in 2014 by Google for holding meetings. However, it did not come with a display of its own, and also did not offer the kind of software traits that the new system kicks in. The Chromebase can be best used by companies set up in smaller spaces where two or more employees from the same room want to speak to one another. It houses a 24-inch display with 1080p resolution and touchscreen support as well. Moreover, it even comes with a four-mic array and dual speakers to facilitate highly audible conversations during video conferences. Details about its internals are scarce at the moment, but we do know that a number of different ports have made their way into this computer from Google and Acer. Placed on its back surface, these include a trio of USB 3.0 ports, a USB 2.0 port and a 3.5mm jack for affixing headphones. And there’s even an SD card reader present for adding more storage to the mix. This new machine has even been equipped with remote management tools to allow technicians to troubleshoot issues without having to walk all the way to the computer. The new Acer Chromebase from Google can be ordered now by businesses in the US, Canada, UK, Ireland and Australia in exchange of $799. This cost will also include management and support fees for one year.